Buckle Up–Every Trip. Every Time. Whether you’re traveling across town or across the country, it’s always essential to wear your seat belt. The U.S. Department of Transportation’s National Highway Traffic Safety Administration (NHTSA) is reminding everyone that seat belts save lives. Buckling up provides the best defense against injury or death in a crash. In 2015, there were 22,441 passenger vehicle occupants (in passenger cars, pickup trucks, vans, or SUVs) killed in traffic crashes in the United States. Almost half (48%) of those who were killed were not wearing seat belts. NHTSA estimates that seat belts saved the lives of 13,941 passenger vehicle occupants age 5 and older in 2015. But if everyone had worn their seat belts on every trip that year, an additional 2,804 lives could have been saved. During the Thanksgiving holiday weekend in 2015 (6 p.m. on Wednesday, November 25, to 5:59 a.m. on Monday, November 30), there were 301 passenger vehicle occupants killed in traffic crashes across the nation. Nighttime is deadlier than daytime in terms of seat belt use. 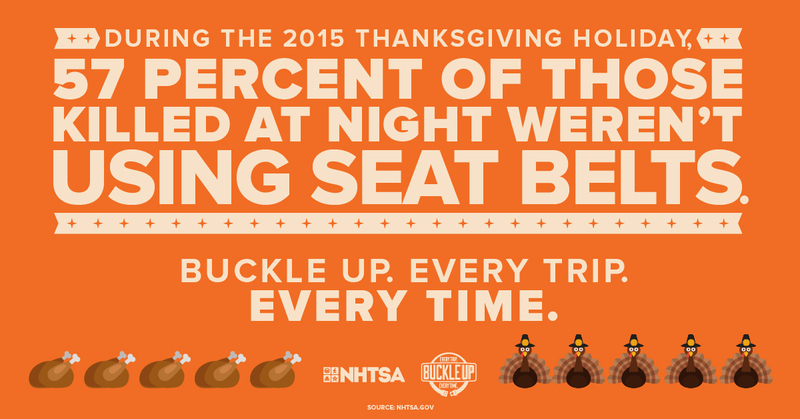 Over the 2015 Thanksgiving weekend, 57 percent of passenger vehicle occupants killed in crashes at night were unbuckled, compared to 49 percent during the day. Throughout the 2014 Thanksgiving holiday period, 58 percent of the passenger vehicle occupants killed in nighttime crashes were unbuckled, while 38 percent of those killed in daytime crashes were unbuckled. Young people continue to be overrepresented in fatal crashes and seat belt nonuse. Among the passenger vehicle occupants killed in crashes in 2015, occupants in the 13- to 15-year-old and 18- to 34-year-old age groups were unbuckled at rates of 57 and 58 percent. Males are more likely than females to be unbuckled in fatal crashes. Fifty-two percent of the male passenger vehicle occupants killed in crashes in 2015 were unbuckled, compared with 42 percent for females. If you’re ejected from a vehicle in a crash, odds are high that you will not survive. In 2015, 8 out of 10 (80%) of the people totally ejected from vehicles in crashes were killed. Wearing your seat belt is the most effective way to prevent ejection; only 1 percent of occupants wearing seat belts were ejected in crashes, compared to 30 percent of those who were unbuckled. Surviving your Thanksgiving drive this year—and making it to next Thanksgiving—can be as simple as buckling up. In the last decade, seat belts saved the lives of more than 100,000 people in the United States. Those people are thankful they wore their seat belts. Won’t you wear yours?